TABLE 5-6. Etiology of Infranuclear Third Nerve Palsy. sis, hypertension, or diabetes mellitus, a common cause of isolated third nerve palsy in adults, is extremely rare in children. Clinical-Anatomic Correlation The anatomic organization of the third nerve nucleus, like that of the sixth nerve nucleus, provides constraints that help differentiate the rare nuclear third nerve palsy from an infranuclear third nerve palsy. Because the superior rectus subnucleus supplies the contralateral superior rectus muscle, and the central caudal nucleus innervates both levator muscles, damage to a single oculomotor nerve nucleus gives rise to contralateral superior rectus weakness and bilateral ptosis. Also, because of the arrangement of the three medial rectus subnuclei and the visceral nuclei within the oculomotor nucleus, a nuclear third nerve palsy is not likely to produce isolated medial rectus involvement or unilateral pupillary involvement. In addition, other midbrain signs such as vertical gaze abnormalities are often associated with lesions of the oculomotor nucleus (see Fig. 5-6). Because the oculomotor nerve innervates the levator palpe-brae superioris, the sphincter of the pupil and ciliary body, as well as four extraocular muscles (the medial rectus, superior rectus, inferior rectus, and inferior oblique), it is easy to identify a complete infranuclear third nerve palsy by the presence of ptosis; a fixed, dilated pupil; and a "down-and-out" eye position resulting from the unopposed lateral rectus and superior oblique muscles (Fig. 5-10). However, third nerve palsies can be "partial"; any individual sign or combination of signs may be present and, if present, may be complete or incomplete. Numerous patterns can therefore arise. Oculomotor nerve palsies, like abducens and trochlear nerve palsies, should be distinguished from myasthenia and mechanical restrictions. Clinically observable involvement of the pupil or signs of oculomotor synkinesis (aberrant regeneration) establish involvement of the third nerve, assuming pharmacological and traumatic mydriasis can be excluded. FIGURE 5-10. Patient with traumatic left third nerve palsy. 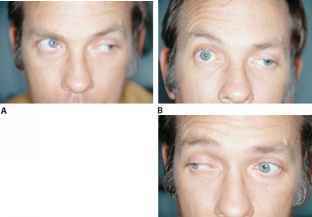 The top photograph shows the classic appearance of a left third nerve palsy with ptosis and the eye in a down and out position. The left photograph shows full abduction, left eye. The bottom right photograph shows left eye with limited adduction. Note, there is lid retraction and miosis, left eye, on attempted adduction indicating aberrant innervation of the levator muscle and pupillary sphincter with part of the medial rectus nerve. 12 weeks after an acute palsy.277 However, aberrant regeneration cannot comfortably account for transient oculomotor synkinesis239,289,454 or spontaneous "primary" oculomotor synkinesis.66,105,289,436,493 Ephaptic transmission, conduction of a nerve impulse across a point of lateral contact, and synaptic reorganization of the oculomotor nucleus are two proposed theories of synk-inesis.289,455 The presence of oculomotor synkinesis has not been reported with demyelination, but it does not otherwise narrow the differential diagnosis of third nerve palsy in the pediatric age group. Aneurysms have been reported to cause isolated third nerve palsies during the first and the second decades of life71,135,157,158,313,383 and carry a high risk of mortality or significant morbidity if left undetected and untreated. On the other hand, aneurysms appear to be rare in children.158,495 Angiography with general anesthesia can be risky in the childhood age group, and the gap between the sensitivity of angiography and MRI for detecting aneurysms continues to narrow. The clinician assesses all these variables along with the history and physical examination to decide on the appropriate workup for each patient. For example, in the child under age 10 with a family history of migraine who presents with nausea, vomiting, and headache, followed by third nerve palsy as these symptoms resolve, that is, with typical ophthalmoplegic migraine, angiography may not be necessary.166 However, when a third nerve palsy acquired in childhood cannot be explained on the basis of the clinical examination or noninvasive neuroimaging, the cerebrospinal fluid should be evaluated and angiography considered. After diagnosis and treatment of the underlying disorder, observation of any recovery of oculomotor nerve function is necessary before surgical intervention. 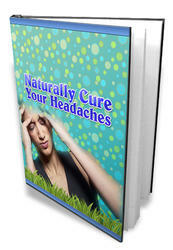 When partial or full recovery occurs, it often does so within 3 to 6 months but it may take 1 year or more. Surgical treatment includes strabismus surgery and ptosis correction. The latter is approached with caution in an eye that lacks a functional Bell's phenomenon because of the risk of exposure keratopathy. Two recent series have found fair to poor visual and sensori-motor outcome in oculomotor nerve palsy/paralysis of children with comparable mix of congenital, traumatic, and neoplastic cases.339,440 The best ophthalmologic outcome with measurable stereopsis was in the resolved cases (3 of 20; 15%) in the first study, and in 4 of 31 patients with partial third nerve palsy in the second study, 2 of whom had spontaneous resolution. In the first series, amblyopia therapy was most effective with congenital causes, but treatment results were poor with other causes; young children with posttraumatic and postneoplastic oculomotor nerve injuries demonstrated the worst ophthalmologic outcomes.